Here's Apple's new Lightning connector, the replacement for the old 30-pin, and the way you'll be charging and syncing all your iPads, Pods, and Phones from now on. 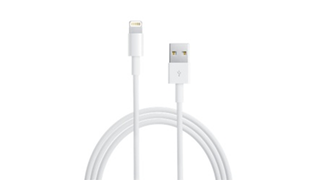 According to Apple, the Lightning connector is more durable, reversible (making it easier to use), and "adaptive". It's 80 percent smaller than the old 30-pin. The cable itself is $20. And sadly, it's only USB 2.0. Ugh. There is an adapter to use old 30-pin gadgets with it, but it looks like it's over an inch thick, and is $30. There's a cable version of the adapter for $40. Before today, Apple had used a 30-pin connector with its iPhones and iPods since 2003, when the third generation iPod switched over from FireWire. The 30-pin connector was useful because it allowed Apple to use the connector to control accessories using only the iPod or iPhone in a way traditional USB connectors couldn't. But over the years, all the old tech stuffed into it became too heavy and too spacious an anchor, so Apple tossed it all out.